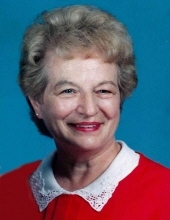 Viola L. Emery, 86, of Fond du Lac, passed away on Sunday, February 3, 2019 at Woodlands Senior Park. She was born on September 11, 1932 to the late Charles and Anne (Mueller) Groeschel in Stockbridge, WI. On September 1, 1956, she married the love of her life, Eugene M. Emery at St. Mary’s Church in Stockbridge. He preceded her in death on September 5, 1998. Vi graduated from Stockbridge High School. She held various positions throughout her life and retired from HC Prange, where she was a switchboard operator at the service desk. She was a long-time member of St. Louis Catholic Church and currently a member of Holy Family Parish. Vi had a big heart. She cared for anyone whom she met during her path in life. She loved to dance, listen to music, cook and garden – she had a green thumb when it came to growing roses. She loved spending time with her grandchildren and family. Vi also enjoyed time with her family at their cottage on Lake Winnebago. Vi is survived by her two daughters, Debbie (Paul) Meixensperger of Fond du Lac and Sharon (Doug) Giebel of Menasha; two grandchildren, Jamie Meixensperger and Jacob Giebel; two step-grandchildren, Amy (Chad) Collett and Melissa (Travis) Late; one sister, Irene Van Oss; other relatives and friends. She was preceded in death by her husband, her parents, three sisters and one brother. Visitation: Vi’s family will receive relatives and friends on Wednesday, February 6, 2019 from 10:00 to 11:45 AM at Holy Family Catholic Church, 271 4th Street Way, Fond du Lac. Service: A Mass of Christian Burial will be held at 12:00 PM following the visitation. Burial will take place in St. Peter Cemetery in the Village of St. Peter. In lieu of flowers, memorials may be directed to the family, a memorial will be established. The family extends their heartfelt gratitude and love for the care given to Vi from Woodlands staff. They would also like to extend their gratitude to the Generations Hospice team. "Email Address" would like to share the life celebration of Viola L. Emery. Click on the "link" to go to share a favorite memory or leave a condolence message for the family.